"Sediment Deposition" today called debris. Our three sites: The whole of New Orleans, the competition site and the study area. The time line of New Orleans hi-grounds, and our intermediate steps. The testing ground: projected sediment deposition pattern. 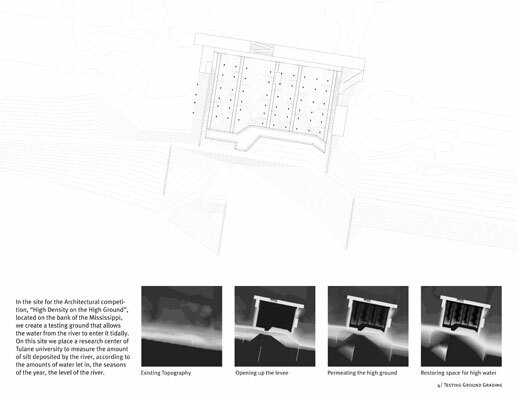 The testing ground: Flood stages and axonometric view of the cat-walk. "Beautiful work. A very smart solution that is unlike other proposals--it allows people who were dislocated to be folded into the project and recognizes that recovery will happen in phases." Our studio project concerns New Orleans. We address the problems revealed after Hurricane Katrina hit New Orleans in August 2005. More precisely the questions we try to answer are: Is the current ecological balance of water and dry land sustainable in New Orleans and if not can it ever be? What went wrong and when as New Orleans kept expanding? 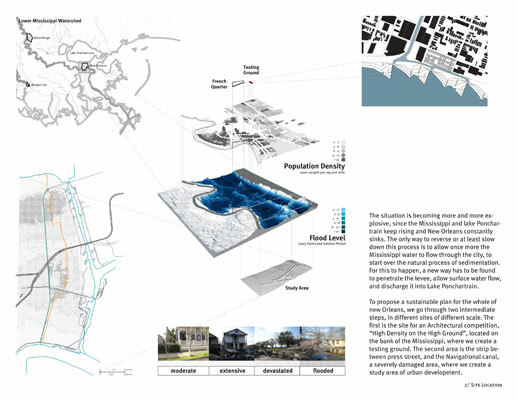 In which ways can we make New Orleans a sustainable environment that can treat phenomena such as Hurricane Katrina and Mississippi floods as natural, and not as a disaster? New Orleans is situated on the bank of the lower Mississippi, an area created from silt deposited by the free flow of the river. However the need to make the Mississippi constantly navigational led to the construction of levees, constraining its course between two strictly defined lines. New Orleans was built along its bank, on the natural high ground. Drainage ditches went through the city tying into a larger canal that redirected rainwater and sewage to the swamps beyond the city. As New Orleans started expanding into the swamp, more drainage ditches were dug and soon became underground, pumping the rain water directly into Lake Ponchartrain and not allowing surface water flow. Prohibiting the Mississippi overflow water and rain water to flow through the city also inhibits the natural process of sediment deposition which created this land, rises it, ad keeps it up. This surface flow happens only in extreme occasions (floods), depositing huge amounts of sediment (today called debris). The situation is becoming more and more explosive, since the Mississippi and lake Ponchartrain keep rising and New Orleans constantly sinks. The only way to reverse or at least slow down this process is to allow once more the Mississippi water to flow through the city, to start over the natural process of sedimentation. For this to happen, a new way has to be found to penetrate the levee, allow surface water flow, and discharge it into Lake Ponchartrain. Our aim is to build canals through New Orleans that connect the Mississippi to Lake Ponchartrain. These canals will discharge water throughout their course into the bowl of New Orleans (created between the levees of the Mississippi and those of lake Ponchartrain), and it will drain tidally into the lake. 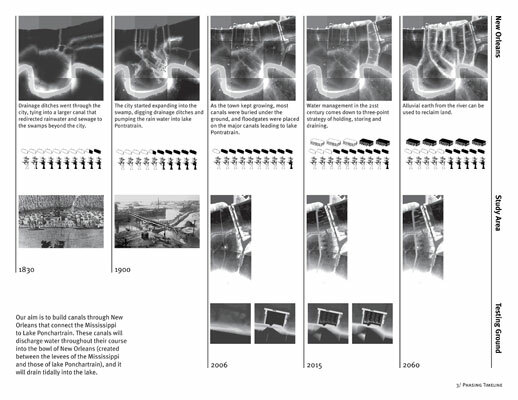 To propose a sustainable plan for the whole of New Orleans, we go through two intermediate steps, in different sites of different scale. 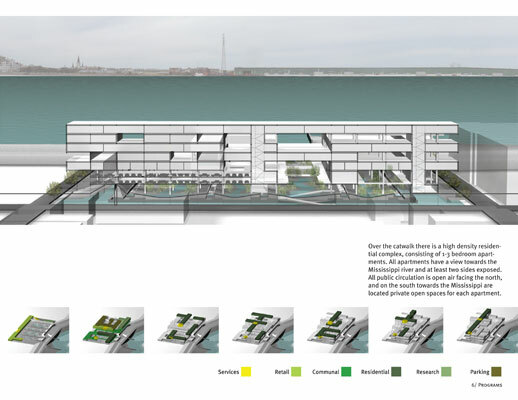 The first is the site for the Architectural competition, "High Density on the High Ground", located on the bank of the Mississippi, where we create a testing ground. The second area is the strip between Press Street, and the Navigational canal, a severely damaged area, where we create a study area of urban development. 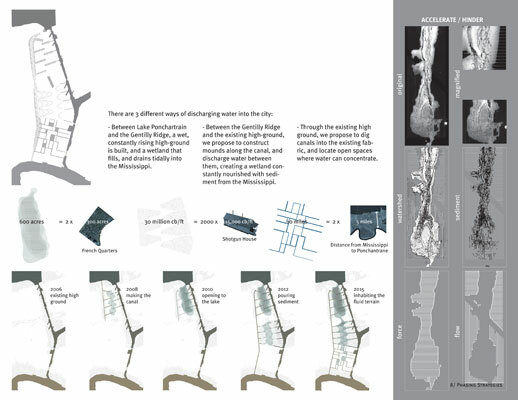 In the site for the Architectural competition, "High Density on the High Ground", located on the bank of the Mississippi, we create a testing ground that allows the water from the river to enter it tidally. On this site we place a research center of Tulane University to measure the amount of silt deposited by the river, according to the amounts of water let in, the seasons of the year, the level of the river. On top of the testing ground we place a cat-walk that concentrates all public activities (retail, communal, entertainment) as well as parking space. Over the catwalk there is a high density residential complex, consisting of 1-3 bedroom apartments. All apartments have a view towards the Mississippi river and at least two sides exposed. All public circulation is open air facing the north, and on the south towards the Mississippi are located private open spaces for each apartment. 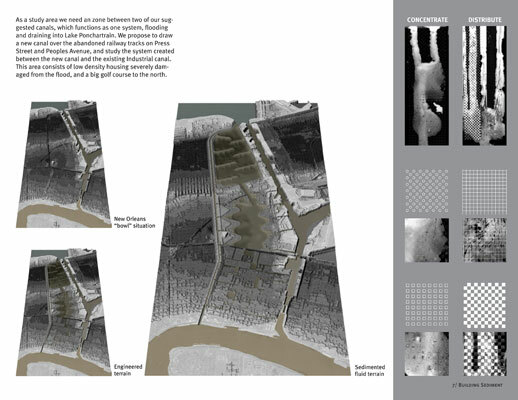 As a study area we need a zone between two of our suggested canals, which functions as one system, flooding and draining into Lake Ponchartrain. We propose to draw a new canal over the abandoned railway tracks on Press Street and Peoples Avenue, and study the system created between the new canal and the existing Industrial canal. This area consists of low density housing severely damaged from the flood, and a big golf course to the north. - Between Lake Ponchartrain and the Gentilly Ridge, a wet, constantly rising high-ground is built, and a wetland that fills, and drains tidally into the Mississippi. 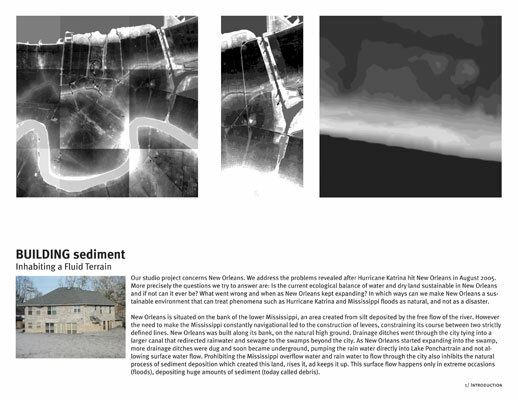 - Between the Gentilly Ridge and the existing high-ground, we propose to construct mounds along the canal, and discharge water between them, creating a wetland constantly nourished with sediment from the Mississippi. 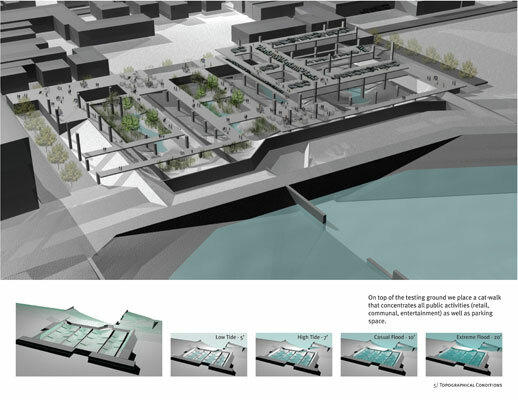 - Through the existing high ground, we propose to dig canals into the existing fabric, and locate open spaces where water can concentrate. 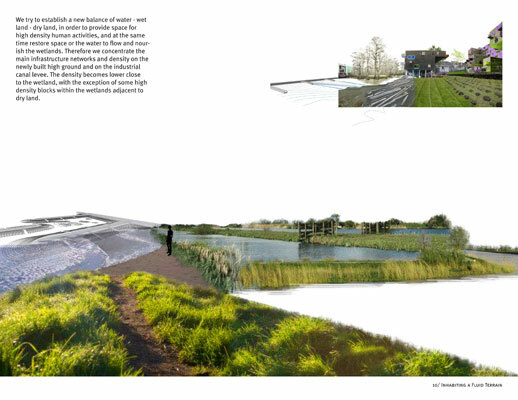 We try to establish a new balance of water - wet land - dry land, in order to provide space for high density human activities, and at the same time restore space or the water to flow and nourish the wetlands. Therefore we concentrate the main infrastructure networks and density on the newly built high ground and on the industrial canal levee. The density becomes lower close to the wetland, with the exception of some high density blocks within the wetlands adjacent to dry land. The testing ground: Building massing and section. The study area: Existing, engineered, and projected views. The study area: Strategies and time-line of water flow. 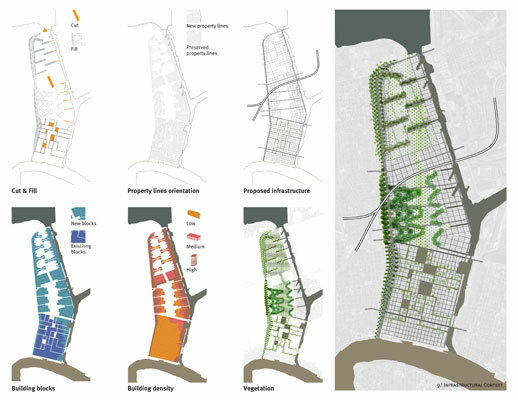 The study area: Urban development diagrams. The study area: Projected image of new urban development.